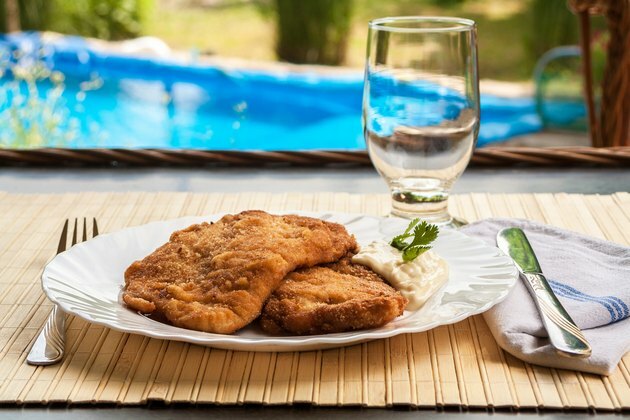 Can You Pan Fry Breaded Chicken in Olive Oil? When you are preparing to pan fry chicken, you should look carefully at your oil choice. Olive oil is lower in trans and saturated fats than many other oils, making it a good choice for pan frying breaded chicken. However, you need to choose the correct type of olive oil in order to avoid burning and smoking. When you pan fry the breaded chicken, coat the pan with approximately 1 tablespoon of olive oil. Use light or regular olive oil. Regular olive oil is also called pure olive oil. Light olive oil could be made up of a blend of pure and virgin olive oil varieties. Olive oil is high in heart-healthy monounsaturated fatty acids and low in saturated fats. Oils that are high in trans and saturated fat include palm oil, coconut oil, corn oil and vegetable oil. For deep frying the breaded chicken, use only regular pure olive oil. According to the What's Cooking America Website, it has a smoke point of approximately 410 degrees Fahrenheit, which is much higher than that of virgin and extra-virgin varieties. Use pure olive oil instead of refined varieties. Using refined olive oil could adversely affect the taste of your chicken. Refined olive oils also can include added solvents that affect the amount of fat and calories in the oil. Pure olive oil has gone through cold pressing and has a light taste that does not affect the integrity of your chicken dish. Avoid using virgin and extra-virgin olive oil to pan fry your chicken. Extra-virgin oil is more appropriate for dressings and dips than for cooking. You can cook with virgin olive oil, but you should use it only to sauté dishes. Don't use virgin olive oil for high-heat cooking methods like frying, and keep the heat at a low to medium setting when sautéing with virgin olive oil.